What we’re used to call “laser printers” are actually toner printer as they use toner in the first place to produce text and images. Yes, the toner is applied using laser, but that’s next step, if you reverse the process of image forming. And now we can witness a real laser printer — Epilog Zing Laser. Well, it’s rather “burner” than “printer” as it uses laser beam to engrave images on wood, acrylic, plastic, leather, cork, glass, treated metals and more. The Zing Laser connects to a computer just like any regular printer. You can use Corel Draw or Adobe Illustrator to create images you want to engrave with the laser. Before printing The Zing take some time to calibrate, but not too long. You can also preview where the design will go before engraving start. 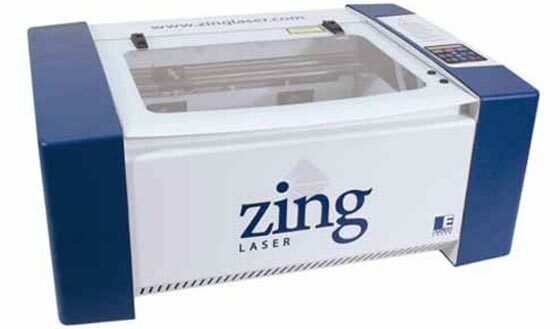 The Zing Laser has 35 watts of power, an all-metal, air-cooled laser tube, and several standard features such as Air Assist and a motorized engraving table. The price of the Zing Laser is $7,995. This entry was posted on Friday, July 18th, 2008 at 1:19 am	and is filed under laser, printer. "Yellow Markings Left by Color Laser Printers Decoded"
"Why Overpackaging Is Not OK and How You Can Avoid It"